This piece was featured on RTE Radio 1’s Sunday Miscellany Programme last year. I will again be featuring on Sunday Miscellany this Sunday – 30th October – with a piece on Owls! Tune in after 9am news. Lovely memories Barbara, I love your decorations. Go with the hoops, why not? You should check out Meath Halloween events, there are some lovely festivals on suitable for adults and children..they are more in keeping with the ancient festivals and look fun! Happy Halloween to you all. PS Just noticed your mention of Sunday Miscellany, will tune in..congrats! I still remember the year someone threw a bright pink plastic bracelet into my bag – the coolest Halloween booty ever! The effort we would put in – my mother would bake buns and my friends and I would ice them in garish colours, we made toffee apples and our own ten-penny bags. I think the sugar was a bigger factor in my day than yours! Lovely post, Barbara, it brought back some lovely memories. 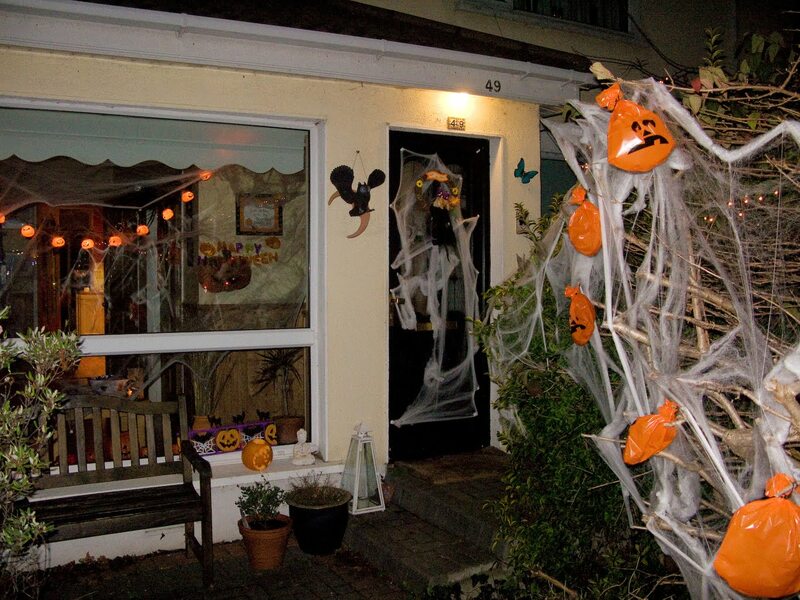 My first Halloween trick-or-treating (we called in 'bobbing' in Arklow, my mother and I still do, proud Dubliners though we are) I was three, and I dressed up as a fairy, but because of the cold my mother put me in blue wellies. The photos are utterly bizarre, like something Flann O'Brien might have dreamt up if he was middle-class in the 80s! What a door! Must have taken you hours, looks great! Great piece. Reading it triggered a flashback to one Halloween where my Dad made me a robot costume. It involved a cardboard box with tin foil on it. He also rigged up a christmas tree bulb to a battery with a little switch so I could flash the light in rhythm with my voice. It must've been about 5 or 6. I haven't recalled that memory in a long time & I'm smiling to myself thinking back now. My own son just turned 5 in August so that brings added resonance. Fair play.